, : Exile target creature you control. , : Exile target creature you don't control. 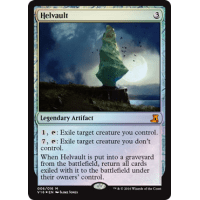 When Helvault is put into a graveyard from the battlefield, return all cards exiled with it to the battlefield under their owners' control.